The brilliantly made “Manchester by the Sea” is one of those movies that seem to operate on a completely different plane of existence. It’s a film that seems so simple but is deceptively complex and emotionally rewarding. When you watch it you’re seeing truly great artists at work. The movie is an almost disturbing reflection of real life as we follow the main character through the process of losing a loved one and becoming close to someone he hardly knows. The film works so well because of its deliberately paced script and direction from the maestro Kenneth Lonergan. He’s set a new standard for impeccably executed domestic drama storytelling. And no amount of adjectives could do the film and the performances justice. Casey Affleck is a revelation in the lead role as a sullen handyman forced to confront the tragedy and grief that has overcome him when he’s unexpectedly forced to be the legal guardian of his teenage nephew. We’re introduced to Lee Chandler (Affleck) as he goes about his boring and lonely life as a handyman and janitor. He shovels the snow from his apartment’s sidewalk and he unclogs tenants’ toilets almost in a Groundhog Day-like loop of mundanity. Then he gets the call. His bother Joe (played in flashbacks by Kyle Chandler) is in the hospital but he dies before Lee can make the long drive there. Lonergan deliberately shows all the steps people are forced to deal with after this happens: the paperwork, the meetings with doctors, seeing the deceased, telling family, making arrangements. It’s almost all too real. This however, isn’t the worst part of Lee’s life; as the script slowly reveals, in flashback form, other events that have happened to Lee before his brother’s untimely death. Lonergan maintains as realistic approach as humanely possible. The stark realities of life and death are contrasted by the stark and cold New England landscape surrounding Lee and those around him. But the film as heavy as it is as times, isn’t nearly as depressing as some of these moments may suggest. Lee is flummoxed to find out that he’s been left in charge of his brother’s teenage son Patrick (Lucas Hedges). What follows is a beautifully budding relationship between uncle and nephew as they traverse the road of grief and loss. Affleck and Hedges play wonderfully off each other; it makes sense considering Hedges is like a teenaged clone of real life friend (and Manchester producer) Matt Damon. The film has enough lighthearted moments and comic relief to help us deal with the film’s tougher themes which is certainly welcomed. 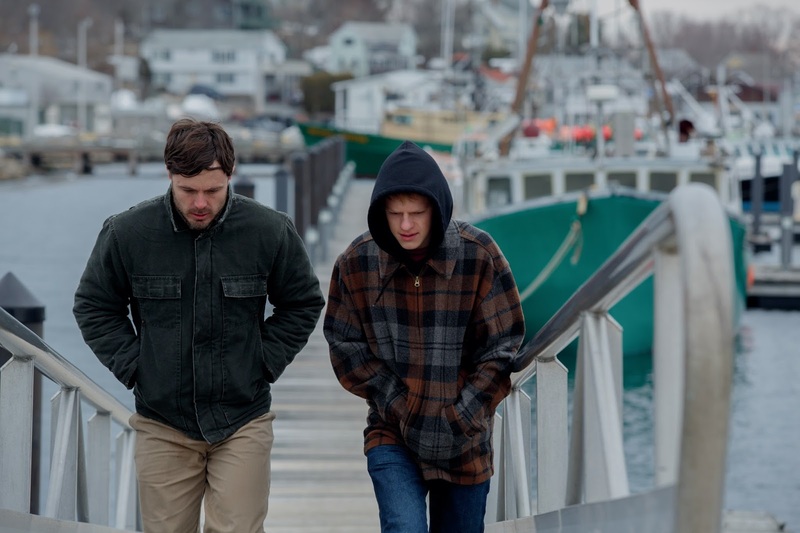 Trailer for Manchester by the Sea on TrailerAddict.